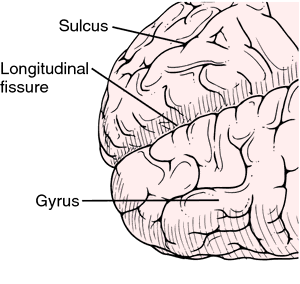 a folded convolution in the inferior parietal lobule formed by the union of the posterior ends of the superior and middle temporal gyri; a gyrus located around the caudal terminus of the superior temporal sulcus. A region of the inferior parietal lobe of the brain that is involved in the processing of auditory and visual input and in the comprehension of language. a folded convolution in the inferior parietal lobe where it unites with the temporal lobe of the cerebral cortex. A region of the inferior parietal lobe near the superior edge of the temporal lobe, and just posterior to the supramarginal gyrus; it is involved in a number of processes related to language and cognition (Brodmann area 39), which links visual input with stored sounds of language. Neurophysiology A region of the parietal lobe which links visual input with the stored sounds of language. See Dyslexia. A folded convolution in the inferior parietal lobule formed by the union of the posterior ends of the superior and middle temporal gyri. Our findings extend our knowledge about the angular gyrus as a center wherein the brain constructs higher-level meaning from individual words during semantic comprehension and plays an important role in the fluent composition of meaning in language," Hamilton said. The angular gyrus is very actively involved in interpreting the letters and words that we read. PET scans during reading showed the same reduced activity within the left hemisphere in dyslexics from all three countries, specifically in and around the angular gyrus. In his view, surges of activity in the right angular gyrus of native signers may occur because this area integrates various lines of linguistic information, including grammar, word meanings, and emotional tone. But some studies suggest that damage to the right angular gyrus and nearby tissue weakens the grasp of complex sentences presented either in writing to hearing patients or as signs to deaf ones. 2000b) have reported fMRI evidence that there is dysfunction at posterior brain regions centered in and around the angular gyrus in the left hemisphere. 1998) measured brain activation patterns and found that the dyslexic adult readers and controls differed in that the former showed relative underactivation in posterior regions (Wernicke's area, the angular gyrus, and striate cortex) and relative overactivation in an anterior region (inferior frontal gyms). Previously, it was thought that the angular gyrus recognised the shapes of words prior to finding their sounds and meanings. The reading disorder known as dyslexia may often reflect an inability of the angular gyrus to work in concert with these related brain regions, hold neuroscientist Barry Horwitz of the National Institute on Aging in Bethesda, Md.